This statement was made by Paul Willis in his classic 1977 book ‘Learning to Labour: how working class kids get working class jobs’ which I have been reading this summer. 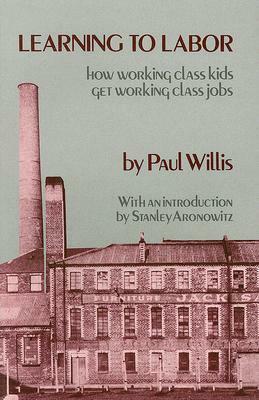 In the book Willis follows a group of young ‘lads’ as they make the transition from school to work, and comes to some fascinating and challenging conclusions. Perhaps the most challenging part of the book is that Willis attempts to demonstrate how the lads’ reactions to school and careers guidance processes while appearing ‘radical’ in some respects actually helps maintain the status quo by preparing them well for working class jobs. So, for example Willis shows how counter-school culture bears some similarities with factory floor culture. Although Willis’ book is dated in the experiences he describes – with vast changes in the economy since the 1970s – there were still a number of points that made me reflect. First of all, was his challenge that any economy relies on large numbers of low and semi-skilled jobs which are essentially the same. For people entering these kinds of jobs, the standard careers-adviser questions about ‘job choice’ don’t make a great deal of sense. Similarly he talks about the ‘educational fallacy’ that upward mobility simply requires individual effort and achievement, stating that this can only ever be possible for a small number of people not the working class as a whole, as the economy requires a large number of lower level jobs. For Willis the ‘lads’ in his study ‘expose’ these fallacies for what they are, but are unable to mobilise any radical response to their insights because of various limitations – which are basically other strongly held beliefs that lead them to accept their lower occupational positioning on the basis of other kinds of superiority (such as sexual superiority coming from the machismo of doing hard physical labour). Now, for my study into rural young people, this is interesting in terms of the way that different young people may respond to the prevailing ideology of their school and careers guidance provision. However, there is also a larger question raised about how the ‘lads’ view careers guidance as (generally) not appropriate to their context. And this got me thinking about how the rural context may also lend itself (sometimes) to a perception that careers guidance is not very relevant. In a rural community like Orkney for instance, if someone wants to stay on the island, then sometimes the notion of ‘choosing’ a career may be inappropriate – because choices are limited, with many training routes unavailable on the island, and numbers of people employed in different sectors sometimes so small that unless someone retires or moves job there may never be an opportunity to work in a particular role. So, I wonder how the realities of rural life impact on perceptions of careers advice and then impact on uptake and experience of careers guidance services? I also wonder if careers guidance is different in its very nature in rural areas – for example I know that many of my conversations centre around thinking about broad kinds of work that interest a client and how to generate opportunities, build networks and create ‘luck’, rather than finding the ‘ideal career’. Categories: Uncategorized | Tags: Careers Guidance, Education, Learning to Labour, rural, Willis, working class | Permalink. The part about location is definitely interesting. My husband works in IT and he would have much more choice available career-wise if we lived either in London or in Edinburgh/Glasgow up here. In a way he’s had to sacrifice that choice because we would rather live in the Highlands so I think it is definitely a factor, depending on what sort of career area you want to go into.